It hit me the other day at the store that it was taking me longer and longer each year to remember a few French words. Primarily because they were already rarely part of my vocabulary but I realize that they are as much fun to remember as they are for Bill to pronounce and learn. In the spirit of sharing and remembering, practicing and growing I have decided to start a new category to this blog, related to food of course, a "French Word A Week" type thing. That word in French always make me smile and hearing Bill say it is even cuter. And you know what...they are delicious! I wish my mom had cooked more with them when we were kids, but now I do everytime they appear at the market. Stay tuned for an upcoming recipe with sunchokes. Won't be dessert though! P.S: I realize I forgot to add the recipe instructions in French for the Chocolate Whiskey Pots de Creme the other day and will remedy that tonight. I love this idea. It's great to learn new words...especially in French! Love this post. I took French in high school, but that means nothing:) I will following along so I can improve my French vocabulary. Thanks! I hope you keep having fun with your parents. They sound amazing! Enjoy! 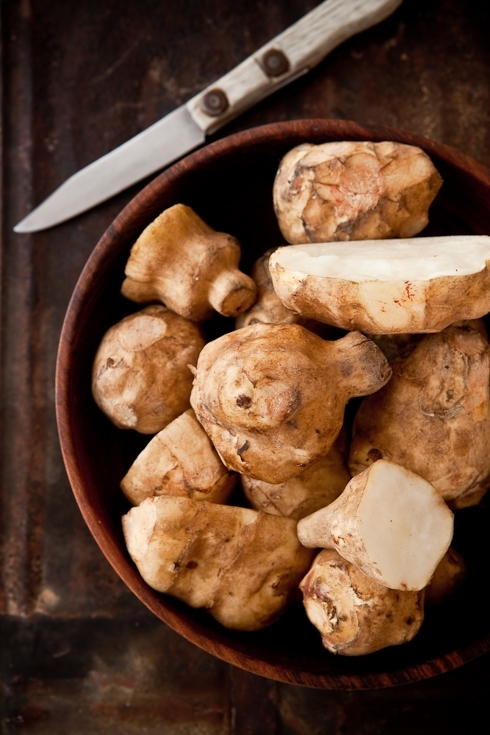 Hmm I've actually never cooked with Jerusalem artichokes - I will have to remedy this, looking forward to your recipe! i love topinambur! i make a mean topinambur and potato soup (even if i say so). They kind of look like potatoes, but I'm guessing they taste more like artichokes? I discovered sunchokes for myself a few weeks ago and really liked them. While the French word is cool, the English "sunchoke" is pretty awesome as well. I can't wait for the recipes with them. As always, your photography is amazing. It has been quite a while since I have left a comment for you, our lives seem to just get busier and busier. Your work and styling is so very divine and each one of your stories are so beautifully unique. We really must meet one day, that's if you ever come to Australia. I know we would have alot to talk about. Today I am looking at a studio (the same studio I had over 12 years ago) so I can finally move my work out of the house. My children are nearly finished their school years and as much as it's been nice to be working from home, we styists collect toooooo many things and my family want the dining room back and the rest of the house, my props have taken over. Ah, sunchokes! Or Jerusalem artichokes, or topinambour, or call them what you will, they are nutty sweet crunchy crisp marvels, no? Roasted, mashed, pureed, souped up, they are ever so lovely. Great idea = thanks. I had a new French teacher almost every year of school from fourth grade through tenth, and each teacher taught first year French. Finally, in college, I got a second year, but the teacher's accent was so abysmal that I should have just taken another first year class. One day . . . this is a start for one of the more important areas - food. Such a great word! This is one I've never learned...never had to use it! But then again, when I lived in France, I was in Paris...I don't remember ever even seeing one! I recently bought a Celine Dion 2 cd French songs. I love it. I listen to it constantly. When I am alone I pretend I actually know French and sing along as if I had a clue. Oh, Helene, I have the opposite problem--I sometimes struggle to find the English word for something. I wonder if we ever totally lose our mother tongue, though. I hope not! We have topinambours here, and they're wonderful. I never saw them when I lived in the US, but they're at all the markets when they're in season. We eat them often. Thanks for this post. I'm looking forward to the vocabulary lessons. AND the topinambour recipes! I think i just twisted my tongue here. LOL. Anyways, I tried those artichokes before and I totally agree with you. I recommend everyone to try those. I studied French for two years at university but never came across "topinambour"... On the photo they look kind of like sweet potatoes. What do you do with them? I have studied French with Rosetta Stone twice (each for a trip to France). I do well while I am there and then forget most everything once home. French is such a beautiful language. I wish we heard more of it in the US. I will look forward to hearing the word of the week! In italian too they are called topinambour, which is also the name I gave to my hamster, as "topina" in italian means "little mouse"! NB: I do love your blog! this sounds like a great idea! I would love to learn more vocabs in french. I took 8 years of it but I am losing my knowledge =(. Can't wait to learn more! Happy Friday! thanks for the picture, so nice ! !!! I made macarons! I thought of you the whole time! I know this is completely unrelated to this post, but I needed you to know! I'll be blogging my experience soon. Also, on a related note, I was an exchange student in France in high school, and I hate to say now that I don't remember sooo much of my French. I want to move back for another 6 months so I can learn it all over again. It's a great idea but you did not start with the easiest, albeit tres joli, word!! Ohlalala! I'm Japanese and I know exactly how you feel... Sometimes I'll be stuck for hours trying to remember a word. I truly admire people who can master so many different languages. I can hardly keep up with two!! what an interesting looking 'choke! I would love to try one! 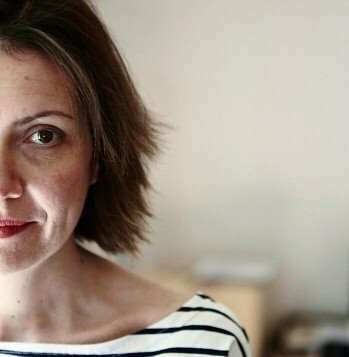 You blog is wonderful and inspiring!!! I tried a lot of your recipes and they were all amazingly delicious and inspiring! And the topinambour is my discovery this year! The only difficulty with them is peeling/washing/cleaning... how do you manage this? would you say POTIMARRON ? I love your French word a week theme. I've been trying (unsuccessfully) to learn French for a while now, so another good read for me!